Members of the Mekons team up with iconoclastic songwriter Robbie Fulks for a collection of their own brilliant take on modern day sea shanties and British folk. Since relocating to Chicago in the ‘90s, the members of erstwhile post-punk collective the Mekons have fully ensconced themselves within the esoteric confines of the Windy City’s alt.country scene. Having released nearly a dozen projects under a handful of guises on the city’s bastion for all things subversively country and Americana, Bloodshot Records, Jon Langford and company seem to have pretty much full reign to do whatever they damn well please at this point. Fortunately, this time out they elected to partner up with perennial underdog and former label mate Robbie Fulks for a subtly affecting collection of folk ballads. Where others would seek to sequester themselves in a Midwestern cabin somewhere in the snow covered woods to write an record an album over a 30-day period – a simple enough prospect given Chicago’s location -, the Mekons and Fulks elected to head a bit further east, alighting in Scotland. More specifically, they made their way to the titular island of Jura off the coast of Scotland. 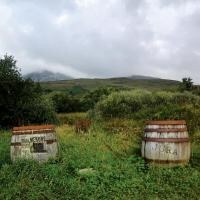 Located in the Inner Hebrides, the mountainous, barren, blanket bog covered expanse of the island proved an ideal locale for the pairing of the Mekons and Fulks on a handful of original songs and ideas derived from folk songs and sea shanties. In this, they managed to create a sound more in keeping with the British folk rock tradition of the late ‘60s than the alt.country scene of the ‘90s. Given their unforgiving surroundings, it comes as little surprise that much of Jura is made up of hauntingly sparse ballads, leaden with melancholy and redolent of the salty sea air that no doubt swirled outside whatever structure in which these recordings were captured. In these spare, percussion-less acoustic recordings, they manage to tap into the heart and soul of their surroundings to create an album that transcends either’s previous work, resulting in something wholly new and different. Opening with the melancholic ballad, “A Fearful Moment", they make clear from the onset that this won’t be the usual drunken tomfoolery and punk-infused country music. Instead, it shows off a sensitive side both lyrically and musically often hinted at but rarely this fully embraced by either. Built upon a series of long, droning tones that eventually resolve into the chorus, “A Fearful Moment” if the fullest track on the album and an ideal opener in its ability to decisively set the tone. While each performer brings their own unique idiosyncrasies to the project, it is Sally Timms who proves the best suited to this stripped down approach. Her keening vocals manage to steal the show on “Go From My Window", “Shine on Silver Seas” and “I Am Come Home". Here she embraces her willowy, untrained voice, finding a perfect fit within these balladic folk numbers. Like a less-sure Sandy Denny or more twee Lavinia Blackwall, Timms manages just the right vocal timbre to sell this trio of songs as being far older than they are. On the opposite end of the spectrum, “An Incident Off St. Kitt’s” is a literary tale of murder and intrigue on the high seas, perfectly suited thematically to the album’s saltier moments. One of the few truly up tempo tracks, it serves as a bit of a palette cleanser, helping to re-shift focus after the lone sore thumb on the album: Fulks’ lead contribution on “Refill". So while the pairing may not have been quite as successful as they may have hoped, they have come away with a handful of lovely folk songs and sea shanties (the singsong “Land Ho!” in particular) that filters an age-old folk song tradition through a contemporary lens. Very close to perfect, Jura is gleefully light-hearted one moment and unbearably tragic the next, making it one of the best releases from either artist in some time.